“Albert’s path is a strange and difficult one,” Special Agent Dale Cooper once observed of FBI Forensics Specialist Albert Rosenfield. 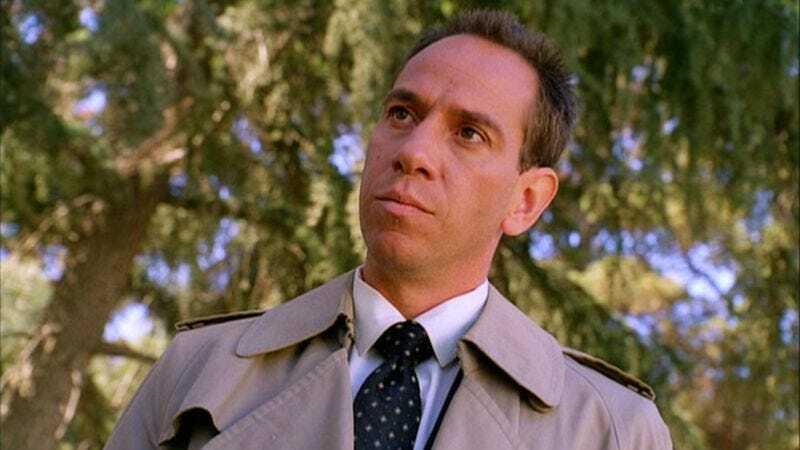 And that path is leading back to the pacific northwest logging town of Twin Peaks, because according to Deadline, Miguel Ferrer will reprise his character for the 2017 Showtime revival of the series. While there aren’t any additional details about Rosenfield’s return, he’ll be missing his nemesis, small-town sheriff Harry S. Truman (Michael Ontkean). It would interesting to see the FBI agent tangle with Ontkean’s rumored replacement, Robert Forster, though. (Forster was once considered for the original deputy role, and went on to work with David Lynch in Mulholland Drive.) No motivation is given for Rosenfield’s return, but it’s likely that either Agent Cooper (Kyle MacLachlan) needs some CSI-type help or Rosenfield simply felt his mission to personally belittle every resident of Twin Peaks was left unfinished. Ferrer’s return hasn’t been officially confirmed, but neither have those of David Patrick Kelly, Richard Beymer, or Sheryl Lee (the latter having been photographed on set, despite David Lynch asking you to cut that out). Instead, announcements have been limited to MacLachlan and some new additions, including Jennifer Jason Leigh, Peter Sarsgaard, Robert Knepper, and Amanda Seyfried.